There’s something primal about gathering around a fire—its appeal is the reason why many of us include fireplaces and woodstoves in our interior living spaces. A fire pit can be a welcome addition to the outdoor spaces of a log home, and it can increase the enjoyment of your outdoor living areas by bringing together friends and family without distractions. Fire pits seem to be all the rage in outdoor decorating. And like many outdoor living accessories, a fire pit can be as elaborate or as simple as your taste and budget requires. Stone or masonry fire pits are relatively easy to construct for the home hobbyist. DIY Networks’ website offers a detailed how-to to construct a stone and masonry fire pit that is durable and good looking. Click here for more information. If mixing concrete, laying stone and firebricks and applying mortar aren’t your style, another site gives a quick guide to dry stacking landscaping blocks into a backyard fire pit. The advantage to dry stacking, according to the site, is that if one of the blocks gets cracked, it’s easy and inexpensive to replace. If you’re more comfortable with a “some assembly required” approach to projects, steel and ceramic portable fire pits may be the answer. They also provide the opportunity to try the fire pit out to see if it delivers the quality family time it promises. 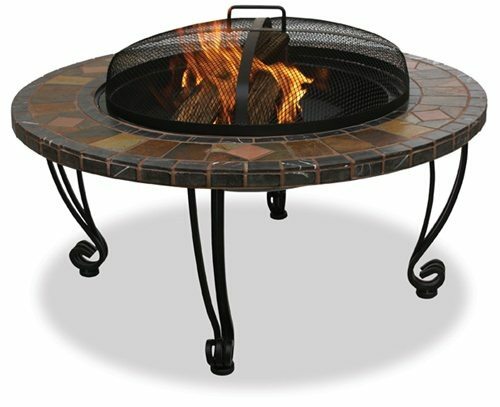 Myfirepits.com offers a wide array of fire pit options, at reasonable discounts. It’s also a good source for fire pit accessories like spark guards, covers and stands. 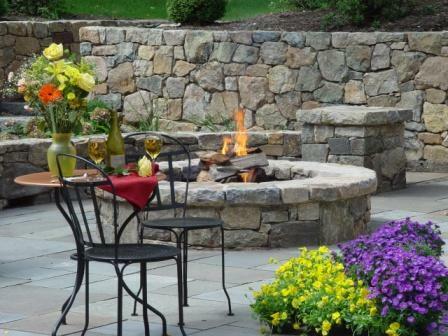 Fire pits can be configured as tables fueled by propane and “cast iron logs” for effect. Other tabletop styles have a steel fire bowl surrounded by slate or ceramic tile table, with a spark cover. Another fun option is a steel fire pit with cut-outs on the side of the container portraying various animal themes or promoting your favorite college team. As with any fire-related accessory, you’ll want to ensure that its placement is a safe distance from combustible materials and away from your home, overhangs, deck railings or vegetation. Placing the portable fire pit on a fireproof slab like stone, or ceramic is also recommended. Keeping a fire extinguisher in reach is also a good idea. Fire pits can warm up an outdoor gathering or give an added bit of ambiance on your patio on cool evenings.